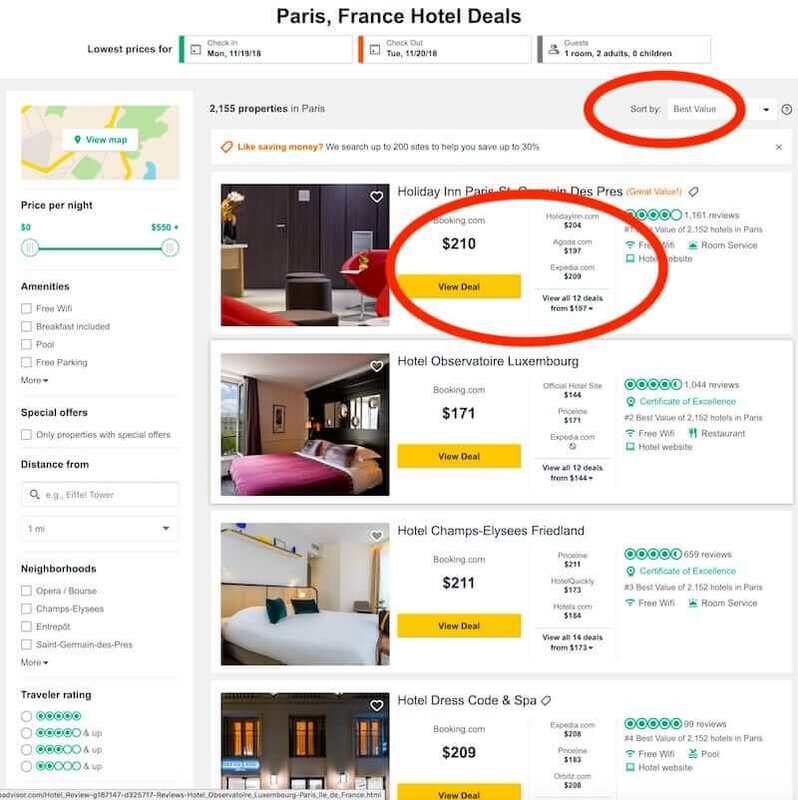 Do Paris hotel deals, discounts, and bargains really exist? Yes - and Paris Discovery Guide will show you how to find them. So check out our 4 top recommendations for easy ways to save BIG on your accommodations. Why pay more than necessary when finding hotel deals and bargains is so easy? 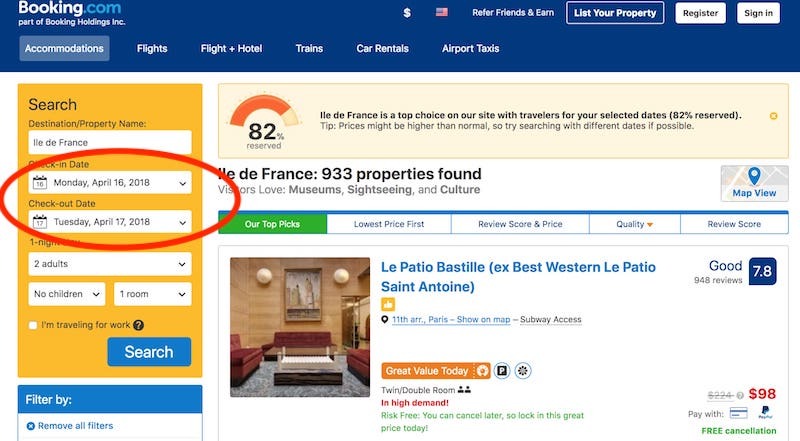 You may have read hotel reviews and checked rates on TripAdvisor - but did you know you can also use this popular website to find the best-value Paris hotel deals as well as the cheapest hotel bargains? 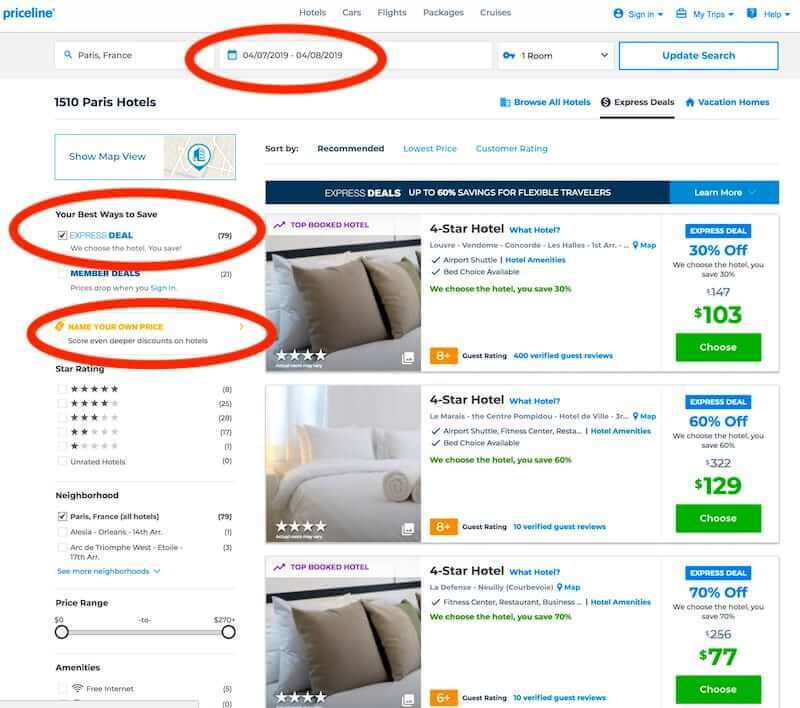 TripAdvisor finds the cheapest rates from over a dozen hotel booking companies such as Hotels.com, Priceline, and Expedia, and shows you the best deal each of them offers. When they feature different rates - which often happens - it pays to take a close look at each booking company's deal. If you know your dates, enter those to get more precise Best Value rates. The hotels you'll see listed are usually located in popular areas of the city, and offer prices lower than other hotels with similar amenities in the same area. They also usually have high or very high visitor ratings. In addition to a featured price shown in bold numbers, you'll see several other deals listed in smaller print. Be sure to check these, especially if they're lower (and at least 1-2 often are) than the featured price. To see all deals, click the name of the hotel. Compare amenities for the offers from each booking company just to make sure that a lower price doesn't mean sacrificing anything you care about, such as a free breakfast. Want to see the cheapest Paris hotel bargains for your dates? Go to the Sort By box in the upper right corner and click "Lowest Price" on the dropdown menu. 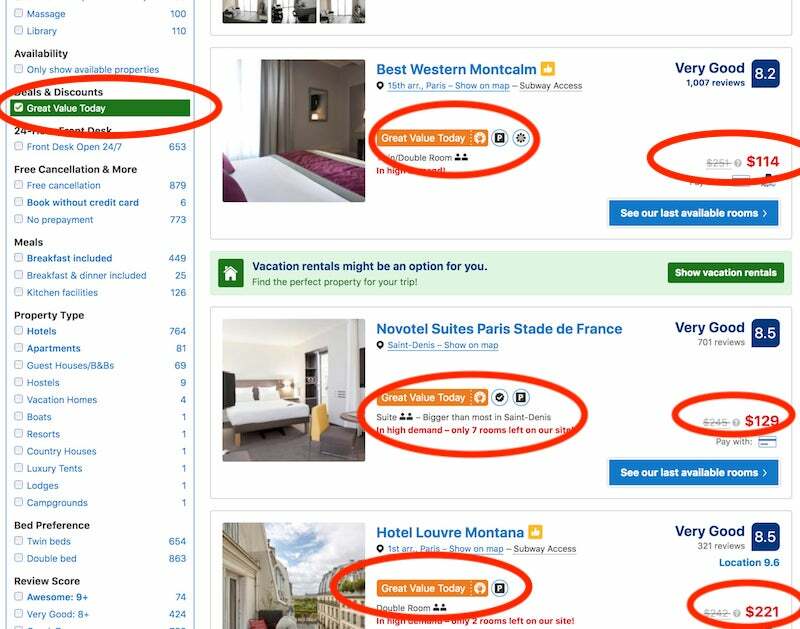 You'll now see some of the cheapest Paris lodging and accommodations - usually a mix of hostels, small inns, and small 1-star, 2-star hotels, or even no-star hotels. Often (although not always) the accommodations will be on the outskirts of the city - still within the city limits, but near the Peripherique, the ring road surrounding Paris. 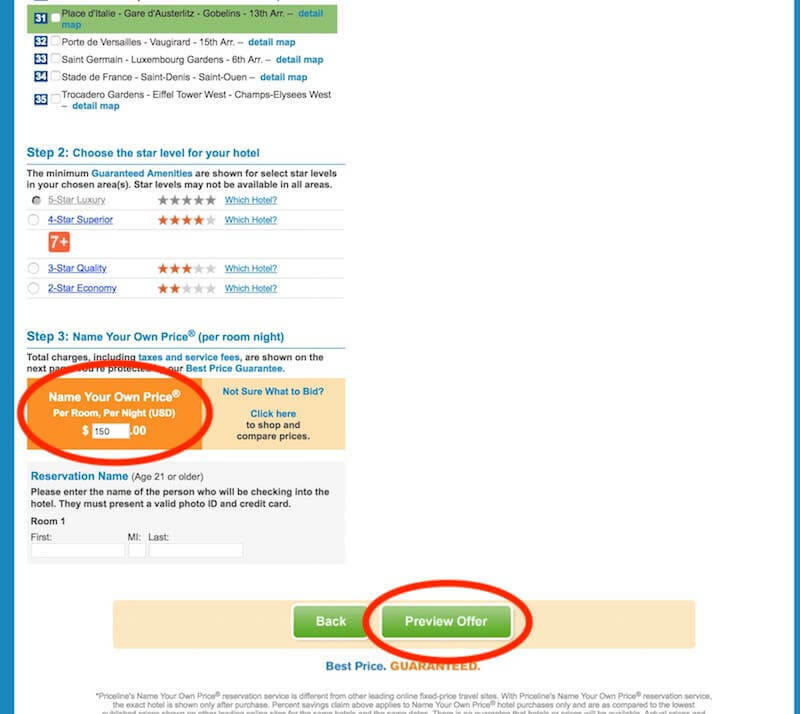 Be sure to read reviews for these hotels carefully in order to understand the tradeoffs behind the ultra-cheap rates. For example, some may be for shared (ie, with strangers) rooms, or have no en-suite bathroom/toilet (meaning there will be shared facilities down the hall), or simply be rather spartan. Others may be in less-gentrified neighborhoods or not be very clean or comfortable. But among them, you may find gems - accommodations to fit your needs at a bargain price. Do you need a Paris hotel within the next few days? Go straight to TripAdvisor's Last Minute Hotel Deals to find the best savings. 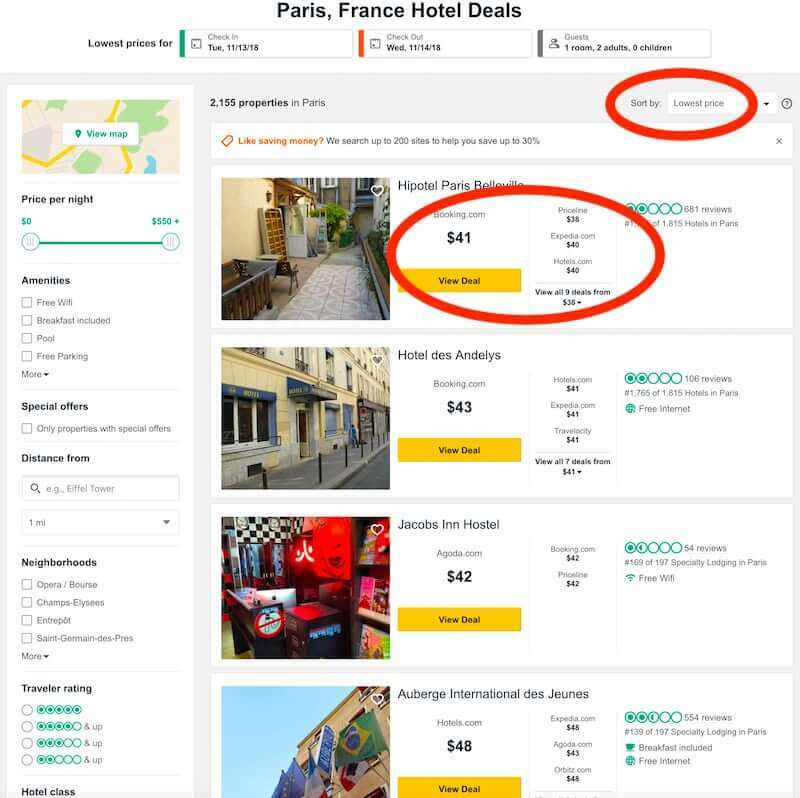 Priceline may be best known for its Name Your Own Price approach to scoring bargain prices on hotels, flights, and cruises - but it also offers a couple of other even easier ways to find sweet deals on Paris hotels. 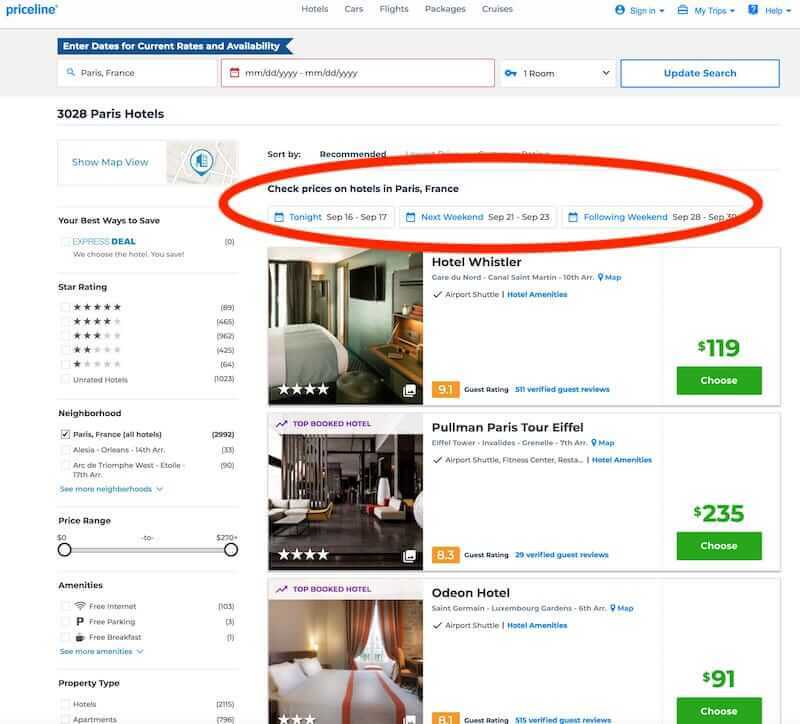 Enter Paris, France in Priceline's search box and they will show you rates for highly rated hotels along with their neighborhood, star rating, and guest rating. Their rates usually range from good to phenomenal. To get more precise rates, enter your dates at the top of the page or click one of the pre-set options in the "Check prices . . . " section. Priceline's hotel deals get even more interesting when you choose their Express Deals. To see those, enter your dates and when the Express Deals box appears, check it. You'll be shown selected properties with Express Deals for up to 60% or even more below the standard rate. The catch? They don't give you the name of the hotel until after you book - but you can see the neighborhood, star rating, guest rating, and amenities. These deals typically get booked fast, so if you see something you like, grab it. Finally, you can also try Name Your Own Price. When you click on the Name Your Own Price button (shown above, circled in red), you'll be shown a list and map of Paris neighborhoods. Click on "detail map" to see exactly which streets are included in each neighborhood. Check the box next to the neighborhood where you want to stay, and choose the hotel star rating you want. Finally, enter the price you want to bid for a hotel in that neighborhood. Taxes will be added later - about 16% of the nightly rate, so on a bid of $150/night, you can expect to pay about $25 in taxes. Once you click Preview Offer, you'll be told whether or not your bid was accepted. Like Priceline's hotel deals? Then you'll love saving with their Package Deals when you book your flight and hotel together. 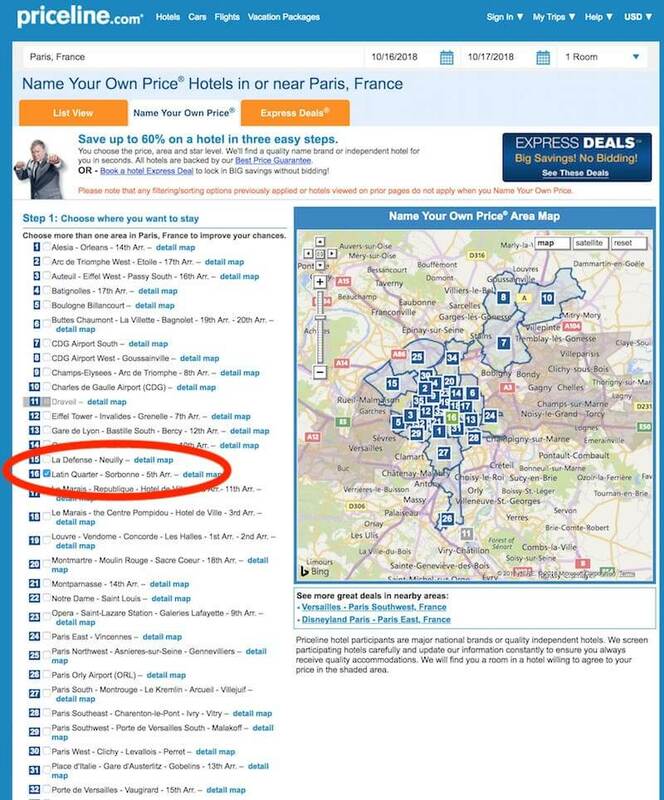 Booking.com offers 2 types of discount deals on Paris hotels: Great Value Today and Price Reduction deals. Price Reduction deals usually give you 10%-15% off, or even as much as 25% off - a nice savings. Great Value Today deals save you the most, but must be booked immediately - look for discounts of 15%-50%, or more. You can only get these deals for certain days, so here's the secret to finding them: You must put in your travel dates in the Search box. You'll now see all the excellent Great Value Today deals. Want to see ALL deals including Price Reductions? Uncheck the "Value Deal" box. To find the best selection of deals on Booking.com, book 3-4 weeks before your travel date. To find the biggest Today deal discounts, book at the last minute.